Multiple student unions jointly declare their intentions to defend the freedom of speech. Tensions over pro-independence posters at Hong Kong University have kept escalating, both physically and on the Internet. Despite the university’s warning and that of the Education Bureau, multiple Hong Kong student unions jointly vowed to protect freedom of speech despite controversy. 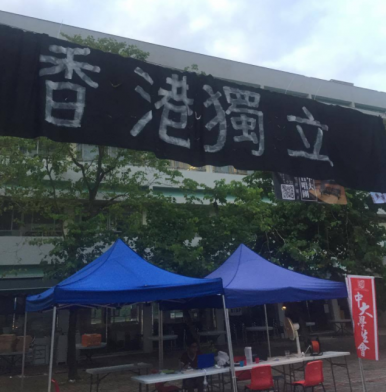 As The Diplomat has reported, the Chinese University of Hong Kong (CUHK) has been draped with banners and signs advocating Hong Kong’s independence since the school year began. The controversial posters triggered a series of debates and verbal clashes on campus. The word “Chee-na,” pronounced similarly to “Shina,” used to be an archaic Japanese name for China. After the outbreak of the Sino-Japanese War, the term has been widely regarded as derogatory and offensive by Chinese people. After Japan’s surrender in 1945, the term was completely banned in official Japanese government documents and at all public occasions. Although Chow later explained that the video was edited and it was the mainland student who verbally attacked him first, his usage of the word “Chee-na” led to outrage among Chinese netizens. On September 8, after receiving multiple internal and external complaints regarding the video clip, CUHK released a public statement condemning the language used, announcing that the school would conduct an investigation and promising to deal seriously with the incident. The video led to fierce clashes on the Internet. Despite China’s “Great Firewall,” thousands of mainland netizens have “attacked” the CUSU Facebook page and Chow, posting criticism, emojis and anti-independence comments. Furthermore, on September 8, the website of pro-independence political party Demosisto was hacked; messages about China’s “socialist core values” with a cartoon of Demosisto Secretary Ggeneral Joshua Wong Chi-fung appeared on the front-page, covering the usual message advocating self-determination. [O]ne of the principles is what they post on the board should be something that is morally sound and also legal… when we talk about freedom of speech, we are talking about the freedom but not without restriction. There are also moral and legal considerations. However, the authorities’ condemnation and mainland netizens’ online attacks didn’t silence the pro-independence voices, but rather provoked greater resistance. Students’ unions stress that everyone enjoys the freedom of speech, and this is the line that we shall never compromise. We are now paying attention to situation across the higher institutions and we are ready to defend our rights and liberty.